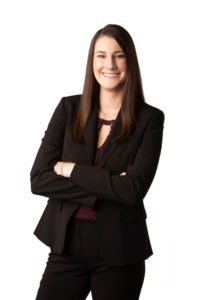 Chelsea M. Healey is an associate attorney practicing in the areas of civil litigation, probate and trust administration and litigation, estate planning, conservatorships, guardianships, minor’s compromise matters, homeowners association litigation, and public agency and municipal law. Ms. Healey regularly advises clients on newly chaptered legislation and complex laws impacting public agencies. She has also successfully assisted in numerous probate and trust administration matters. While at the firm, she has worked on behalf of private citizens, municipalities, and Indian Tribes on complex civil litigation matters. During law school, Ms. Healey was the recipient of several prestigious awards, which included two Dean’s Certificate of Achievement awards for Legal Communication and Research I and the Investor Rights Clinic; two CALI Excellence for the Future awards for Legal Communication and Research II and the Investor Rights Clinic; the American Board of Trial Advocates Award (ABOTA) for being the top 3L civil litigator in the law school’s nationally-recognized Litigation Skills Program; and the H.O.P.E. Pro Bono Challenge Award. Additionally, Ms. Healey was selected as a Writing Dean’s Fellow, a H.O.P.E. Summer Public Interest Fellow, and a Research Assistant to the Chair of the law school’s Legal Communication and Research Department.